Are you smarter than a 5th grader? What a silly question! Of course you are. Well, probably. I mean, I don’t know you very well. But odds are, if you are reading this, you are much smarter than the average 5th grader, or even the above-average, carefully screened 10- and 11-year-olds that appear on the popular Fox Network game show. That isn’t to say you won’t get tripped up on a trivia question that even a 5th grader could answer correctly. Why, I’d wager even a guy like E.D. Hirsch, author of What Your Fifth Grader Needs to Know (among other bestsellers) might need a “save” if he ever appeared on the show, or took a crack at Capcom’s video game version for the iPhone and iPod touch. Capcom’s Are You Smarter Than A 5th Grader? 2009 app gives you a shot at outdoing those morons from the palm of your hand. The game, although challenging, isn’t as smart as I expected from such a well-known game developer. Like the TV show of the same name, the iPod version of Are You Smarter Than A Fifth Grader? pits you against a group of students—or at least their avatars. The good news: Host Jeff Foxworthy is nowhere to be found on this app. The bad news: The game’s lethargic pace might make you wish he were. 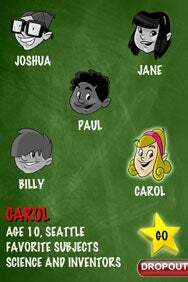 The game attempts to replicate the TV show’s process of selecting among a group of 5th graders and pitting your knowledge against their “expertise” in such elementary-school subjects as English, math, science, history, social studies, geography, and spelling. You choose from five student avatars for two questions a piece. Each student has his or her own favorite subjects. The more questions you get right, the more money you earn—up to $1 million (collectable from your local Department of Internet Money). As on the TV program, you can “peek” at or “copy” a student’s answer only once. And, as on the TV program, the student’s answer won’t always be right—proving once and for all that even some 5th graders aren’t as smart as 5th graders. The game shouldn’t be tedious, but it is. All of the screens seem to load in slow motion and the buttons respond sluggishly. The graphics are nice but the sound effects—audience applause and disappointed “awws”—don’t add much. Game play, apart from being slow, has at least one obvious flaw. The game is supposed to show you the correct answer—because sometimes 5th grade trivia is tricky and you may not know that a flea is a better jumper than a kangaroo, for instance. It does not work—rather, it didn’t work for me at first. I needed to go into the option screen, switch off the “show answers” button, play a game, and then switch the button back on before the feature displayed correctly. The questions and answers are fairly extensive and diverse. I played the game close to two dozen times and didn’t notice any repeated questions. But I quickly grew impatient with the whole thing. I may not always be smarter than a 5th grader, but I’m wise enough to know what I like. Are You Smarter Than a 5th Grader? 2009 edition is compatible with any iPhone or iPod touch running the iPhone 2.x software update.